A Doctor of Podiatric Medicine (D.P.M.) 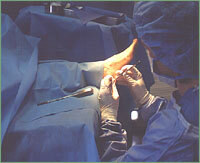 practices the medical, surgical, and biomechanical treatment of the human foot, ankle, and associated structures. Although specializing in problems affecting the foot and ankle, doctors of podiatric medicine (DPMs) are also well-rounded, highly-trained health care providers. Podiatrists see people of all ages and are often the first medical specialists to diagnose systemic problems that affect the feet and ankles such as diabetes, gout, hypertension, immunodeficiencies, and arthritis. The training of a podiatrist normally involves a four-year Bachelor's degree, followed by four years of podiatric medical school, followed by two or three years of residency training. Podiatrists function as partners in the larger medical community and regularly consult with physicians in other medical specialties. Diagnoses lower extremity pathology such as tumors, ulcers, fractures, skin and nail diseases, and congenital and acquired deformities. Makes independent judgments, prescribes medications, utilizes x-rays, MRI, ultrasound and other laboratory tests for diagnostic purposes, and orders physical therapy. Treats conditions such as: corns, calluses, bunions, heel spurs, plantar fasciitis, ingrown nails, cysts, bone disorders, and infections of the foot. Fits corrective inserts called orthotics that address walking patterns to improve the overall ability of effective and efficient ambulation. Provides consultations for the patient and for referring physicians regarding prevention of podiatric problems and possible treatments. Performs surgical correction of the foot including: hammertoes, clawtoes, bunions, fractures, infections, ruptured ligaments and tendons, and neuro-vascular abnormalities of the foot.